Silent Retreat is one of director Tricia Lee's first feature length horrors, the second being Clean Break that I shall be reviewing soon. 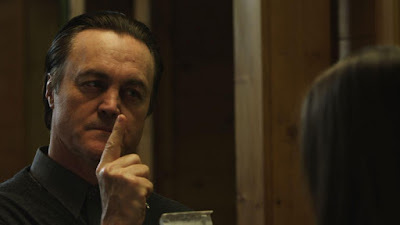 This film won Best Canadian Feature at the Toronto After Dark Film Festival, and was an official selection at the Nocturna International Fantastic Film Festival. This is quite a slow burner, but with something always going on and with questions ever on my lips I was not bored, this was despite the lack of much dialogue which I actually found to be quite novel. The first hours horror really comes from Janey slowly figuring out what is going on with the strange doctor's experiments, it kind of felt like a Goosebumps episode with scenes of girls being dragged away against their will only to turn up more mellow and controlled, punishments to any rule breaking usually resulting in having the food taken away. Nolan does a good job as the main antagonist, looking like an older version of Leonardo DiCaprio he oozes control, his sons though are quite under developed, all I really got from them was that one was stupid and the other handsome but both stooges and with no personality of their own. With glimpses of a strange beast prowling the grounds I knew at some point Silent Retreat would change tracks and become a creature feature and that is indeed what happens at around the hour mark. Of the creature itself it is slowly revealed, thankfully so as things always look more threatening when you can't see it is just a guy or gal in a rubber suit. I was dreading the moment I would finally see it fully as I was expecting a travesty but actually it wasn't that bad a look, not amazing but far better than many others I have seen. With this change in genre there is a sudden onset of blood and gore, characters get covered in crimson, while there are some violent deaths including someones entrails getting pulled out, and someone getting a shard of glass through their eyeball. The fact it is so late into the film that it becomes so gruesome was effective in making it seem all the more over the top in the best possible way. Silent Retreat has a quite a feminist tone to it which gets nearly too heavy handed at times, the overseers are all male of course and by their rules they put their control over their female wards. Meanwhile the girls who have been sent there for rehabilitation are all supposed to have committed crimes but of the two who have their 'crimes' revealed one is shown to have attacked a man who tried to force himself on her, while another was arrested for holding some sort of gay pride demonstration in the middle of a street (something like that). Without spoiling things there are more obvious displays of mans controlling nature throughout with the message seeming to be being meek and submissive isn't a good thing. The monster looks ok but it has some more unique properties to it, with the reason silence is treasure being a clue about it. The plot is a bit silly in that why the men would think living in such a dangerous place was a good idea I do not know, and how they have managed to get away with their crimes for so long is ridiculous. Meanwhile the creature is pretty inconsistent in its reactions to certain things. 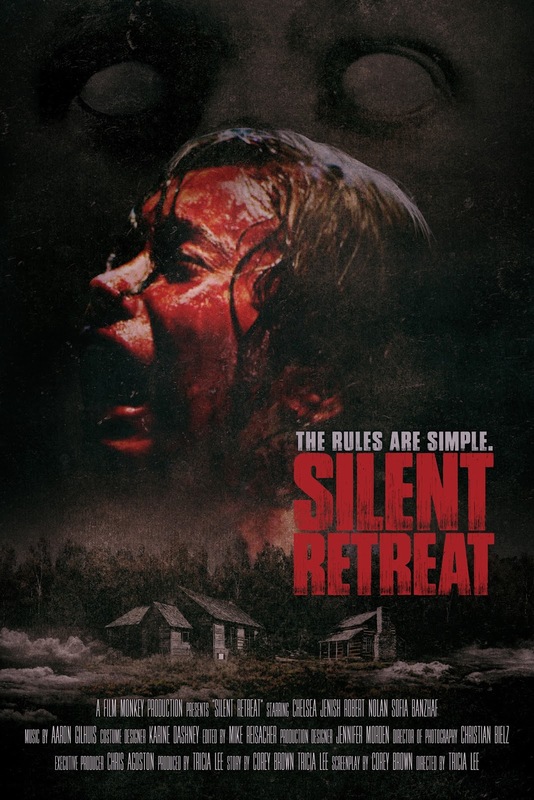 There is a clear plot arc and while bizarre at least Silent Retreat did something different, also the score is pretty decent, mournful almost but fitted the tone well. I enjoyed the film and if you stick around to the final third the pace really picks up with some great looking blood and effects, just be prepared for a slow opening and some under developed bad guys. Silent Retreat is available to buy now.